Fourteen years ago today, on April 22, 2004, Pat Tillman was killed by gunfire while on patrol in a rugged area of eastern Afghanistan. The unfortunate death of this young man occurred in Southeastern Afghanistan in Operation Mountain Storm—a subset effort of the larger Operation Enduring Freedom designed to weaken al-Qaeda forces and the Taliban government. If you don’t know who Pat is let me quickly introduce you to this soldier. Patrick Daniel Tillman was born the oldest of three brothers in San Jose, California. He played linebacker for Arizona State University, where during his senior year he was named Pac-10 Defensive Player of the Year. In 1998, Tillman was drafted by the Arizona Cardinals. He became the team’s starting safety as well as one of its most popular players. In 2000, he broke the team record for tackles with 224. In May 2002, Tillman turned down a three-year, multi-million-dollar deal with the Cardinals and instead, prompted by the events of 9/11, joined the Army along with his brother Kevin, a minor-league baseball player. The Tillman brothers were assigned to the 75th Ranger Regiment in Fort Lewis, Washington, and did tours in Iraq in 2003, followed by Afghanistan the next year. In today’s world of instant gratification and selfishness, it might not make sense for a man to leave a profession that pays him about $1.2 million a year for a new career that pays about $20,000 a year. However, it makes complete sense when you understand who Tillman was. 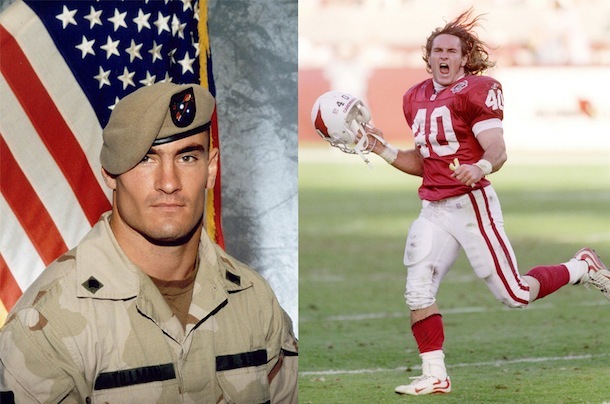 What is interesting with the Pat Tillman story is the two narratives that typically accompany it. The other narratives assumes Pat was naïve for trading the riches of a professional football career to chase Osama bin Laden. To most of America, Tillman is symbol of patriotism. To others, he is a hero for choosing service over wealth. To me he is a man who followed his heart….and it led him from the football fields of Arizona to the mountainous terrain of Afghanistan. Pat Tillman discovered his calling, his purpose, his mission and he was willing to risk and sacrifice everything for it. Do you pursue your calling with the same energy? This entry was posted in Family, Leadership, Misc, Sacrifice and tagged calling, Pat Tillman, purpose, sacrifice, service.